Product #60739 | SKU ES-T86-AB | 0.0 (no ratings yet) Thanks for your rating! Arm your camera with this Tilta Camera Cage with Gold Mount Battery Plate specifically designed for the Panasonic EVA1. 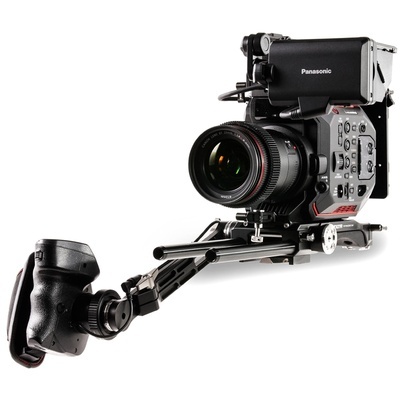 The cage’s top plate fits snugly around the Panasonic EVA1 top handle and includes 15mm LWS rod adapters on the front and back end to allow you to mount accessories in a variety of ways. The Tilta Battery Plate for Panasonic EVA1 Cage has a 15mm LWS rod adapter that can be placed on either the top or bottom of the plate to allow you to either mount it off of 15mm LWS rods from the top plate or baseplate. The battery plate provides several different DC and P-tap outputs to allow you to power accessories. An extendable rosette arm and extension cable are also included so that you can extend out and adjust the mounting position of your Panasonic EVA1 handle to your liking. To further customize your operating setup, an LCD extension arm is also included in the package to allow you to further articulate the positioning of the LCD for maximum comfort.